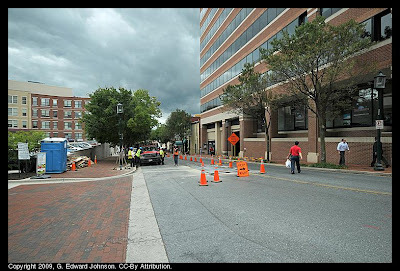 Elm Street, east of Woodmont Avenue in Bethesda, MD isn't a terribly busy road. I do, however, tend to notice when they start doing road work and close one lane, using flagmen to alternate traffic through the area. And, when they do that for multiple days, well, a post is in order. Yesterday they had the grates off and were working in the pit. Today, the grates are on and it actually looks to me like they are about done. I don't know when they started this project.